"Rey has brown hair and she is very cool. Nutella is also brown and delicious. I think Porter will have fun with his brown week. <---Direct quote from my almost 5 year old when she saw Porter's brown shelf. You can't argue with logic like that! Humble brag, but I think this is my best manipulative shelf yet! 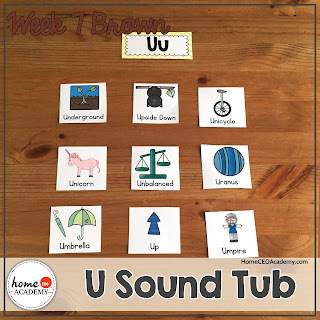 Porter was all about the letter sounds tubs this week. Remember everyone; progress over perfection! Porter has not been into the letter sound tub the last few weeks, so I haven't been forcing the issue. This week, he saw me cutting them up and said "Oh! Lemon!" So I dropped the scissors and started playing since he became suddenly engaged. 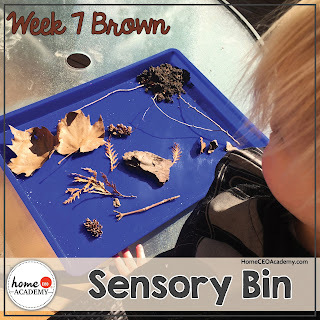 We went on a scavenger hunt in the back yard to make our brown sensory bin. 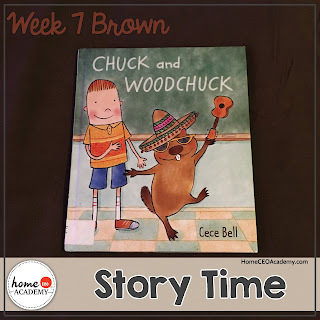 This unit is filled with super cute and fun read aloud stories, but this one is my favorite of the week! We are on a big colouring kick right now! 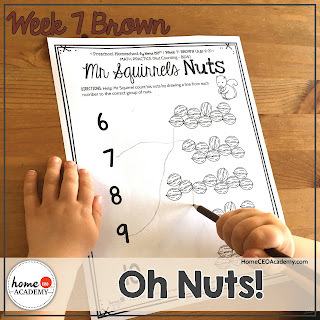 Help Mr. Squirrel draw a lone from the number to the proper quantity of nuts! **Home CEO Hack** Once your little one is done with colouring in the 7s, ask them to colour all the 6s a different colour! 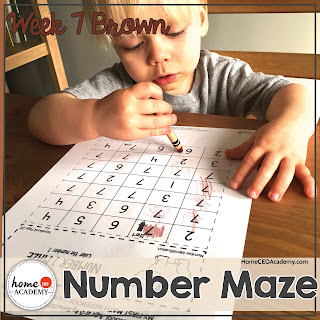 This is a great chance to review numbers and colour recognition! 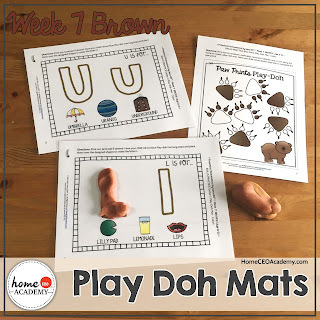 Play doh time is always fun! 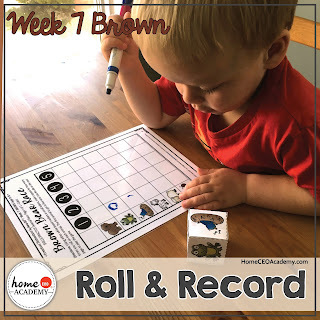 Intro to graphing with this fun "Brown Bear Race" roll and record activty! 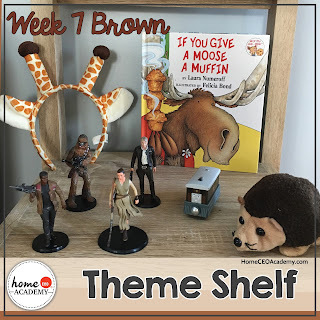 Well, I think my daughter was right, Porter and I did have a lot of fun with brown week. To those of you saying "These tot schooling activities look amazing, where can I get there?" The answer is here. 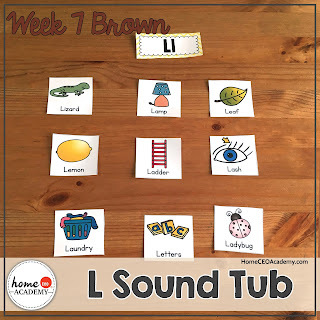 Brown week is part of our 45 week preschool homeschool curriculum. See you all next week when learn about Saint Patrick's Day! 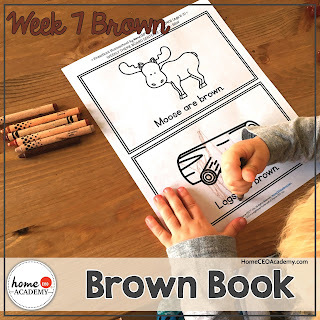 "Brown rhymes with down, clown, and zown. Just kidding, I made up the last word." <--- Another quote from my almost 5 year old.